Eggs! How do you eat yours? There are numerous ways of using eggs in recipes and I have added a couple of my own tasty recipes for you to enjoy below. Eggs are nutritious too. They are full of protein, vitamins & minerals. Try and select organic or free range eggs, more yellow and more yummy. The cheaper eggs come from caged hens and the poor things do not get to see the light of day and are farmed in the cheapest way possible. Also if you select eggs with the Lion quality stamp you know they have been laid by hens who have been vaccinated against salmonella. Well you needn’t be! 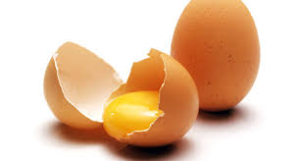 The cholesterol found in eggs is not the culprit and is also much lower than previously thought. It’s the saturated fat that you consume that can raise the levels of your blood cholesterol. So it it’s how you cook your eggs that can be cause for concern. We all love a good fry up from time to time but use fats sparingly when frying your egg. A little olive oil is all that is needed and for a healthier alternative try coconut oil! You’re probably thinking, hang on a minute didn’t she just say that it’s the saturated fats that you need to be more aware of?? Yes I did but coconut oil is an exception. The fatty acids found in coconut oil has amazing benefits on your health. More about that another time. Try this recipe for a healthy kick start to your day. Melt coconut oil in pan and put 3 mounds of mixture into frying pan. Frying until lightly brown, pressing down to flatten. Turn over so both side cooked & enjoy. Use a spoon to scoop out enough avocado to make room for the eggs. Place avocado in a tin or oven proof dish so they do not roll around. TIP: You can slice a little of the bottom of the avocado to give them a flat base so they do not roll around. Crack an egg into each half of the avocado and sprinkle with Sea salt & black pepper to taste and add a pinch of chilli flakes. Bake for 8-15 minutes depending on how you like your eggs done. Sprinkle with some chopped chives & serve with a rich green salad. Delicious! Recipes have been taken from my cookbook, Fabulous Funfit Foods, which contains 30 breakfast, 30 lunches & 30 dinners recipes. Quick and easy healthy nutritious meals. Click on the following link to purchase & download your copy. all for just £9.99.